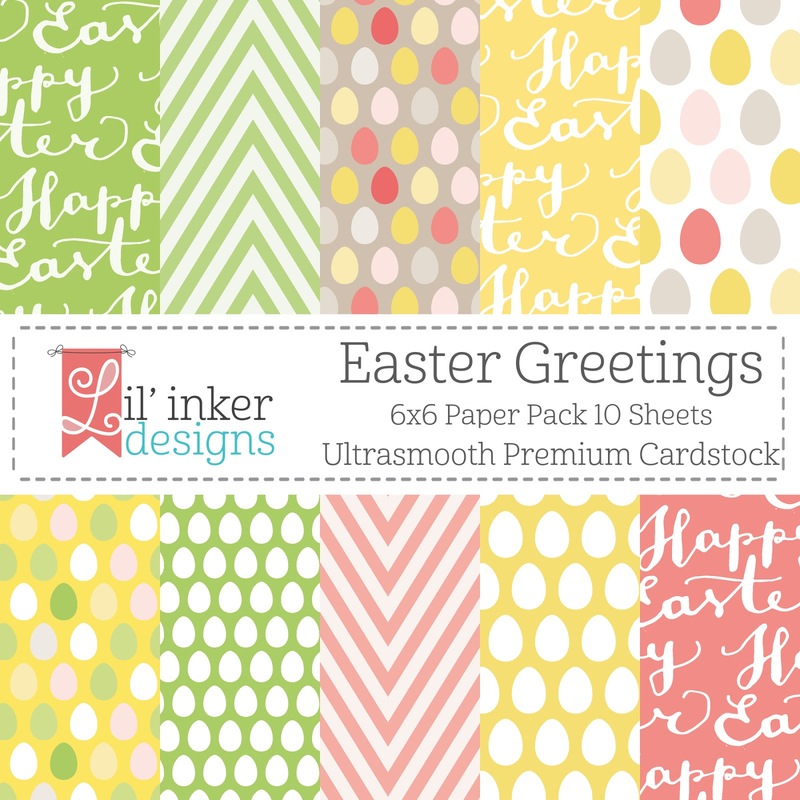 It's the first day of the Lil' Inker Designs March Release! As usual, I love the new products, and I am pretty sure that you will too. 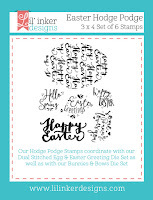 Once again, we have a fabulous hop for you featuring innovative stamps and dies! You should have arrived from Sarah Jay's Blog! 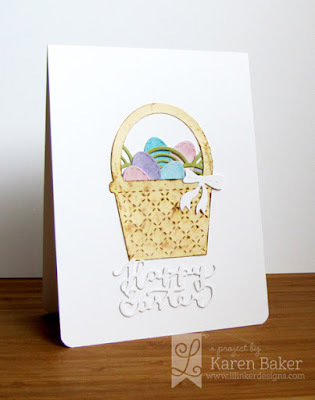 I have quite a few cards to showcase today, because there are that many amazing products being released! This first one features the lovely, new Stitched Easter Basket Die Set. 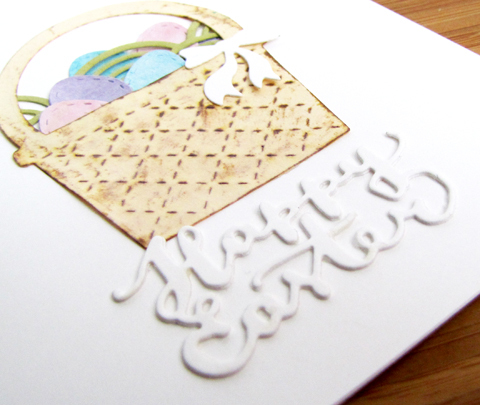 I die cut the basket from cream colored cardstock, first inking the actual die up with Vintage Photo Ink. 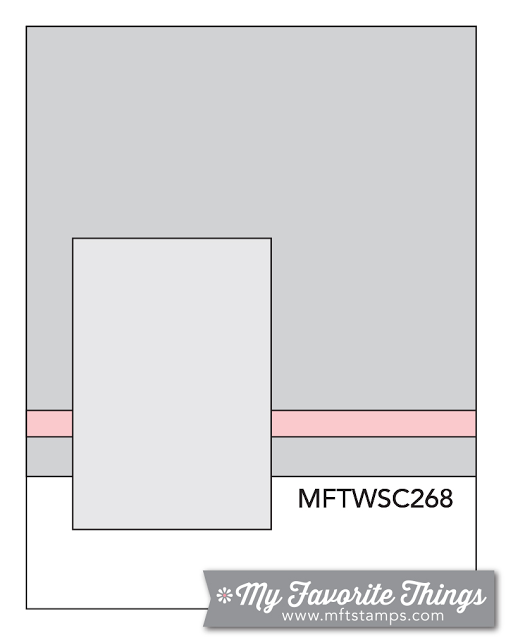 I then spritzed the die cut with water, so the ink that was impressed into the paper with the dies became softer. 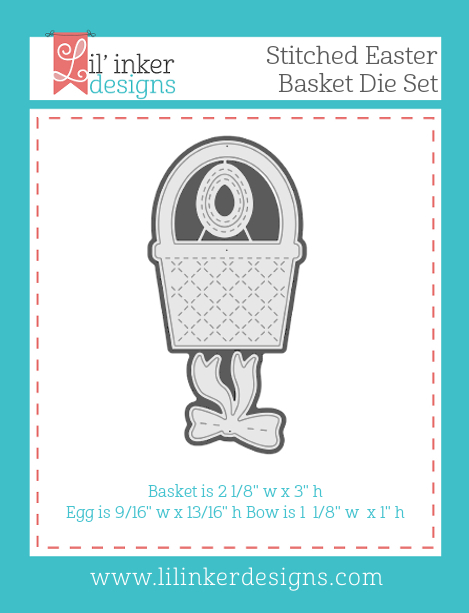 I filled the basket with custom inked and die cut eggs, added "grass" from made from green cardstock die cut from a previously released product, Fanfare Scalloped Border Die. I finished the card with two die cut and glued layers from the beautiful Dual Stitched Egg & Easter Greeting Die Set. 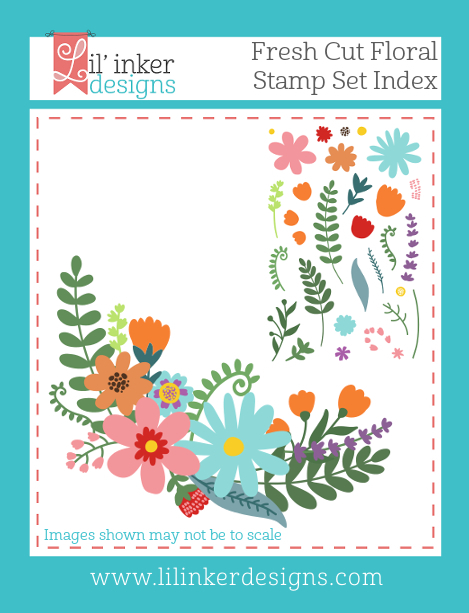 This next card features some simply beautiful, new stamps and dies, Fresh Cut Flowers. 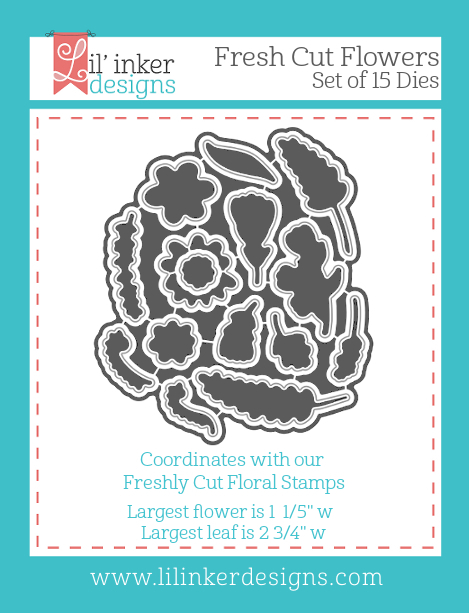 I started by die cutting the entire set dies from Fresh Cut Flowers Die Set from pale green cardstock. I then stamped each of these with various shades of green, and some blue from the Fresh Cut Flowers Stamp Set. 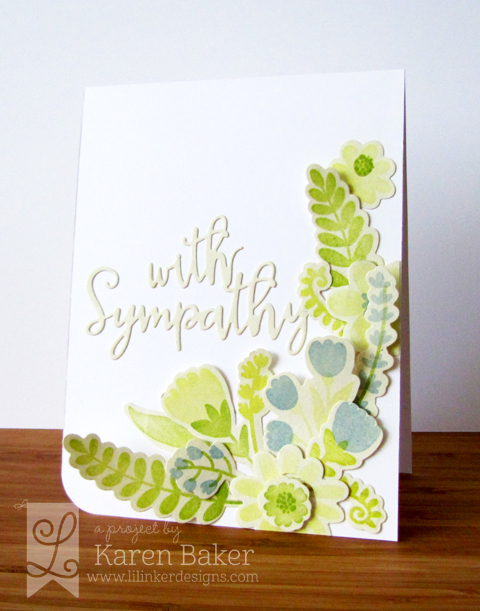 I adhered them onto a white cardbase and finished the card with a die cut sentiment from the With Sympathy Word Die. 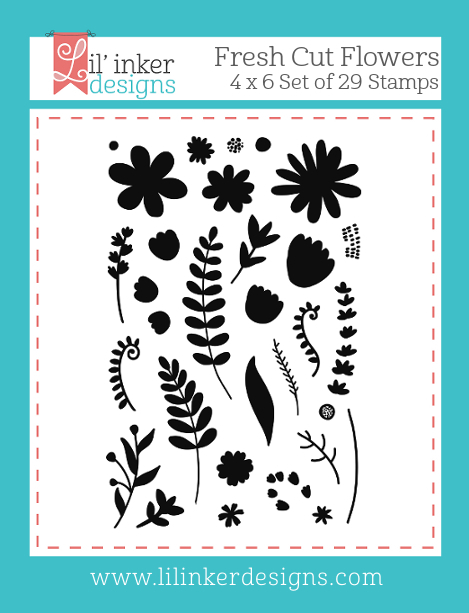 These flowers were so very easy to stamp and arrange, and in any combination it will come out beautifully. And one final card for today! This Easter card came together so quickly and would be perfect for mass producing. 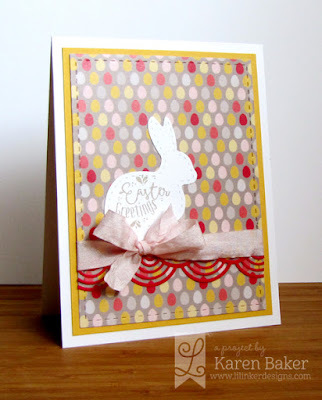 I adhered a panel of one of the pretty patterns from the new Easter Greetings Paper Pack that was die cut with the second largest rectangle from Lil' Inker Designs Stitched Mats: Rectangles onto a yellow cardstock panel, first tying a bow made from May Arts Pink Wrinkle Ribbon. I tucked a beautiful scallop underneath the bow (made from the Fanfare Scalloped Border Die). 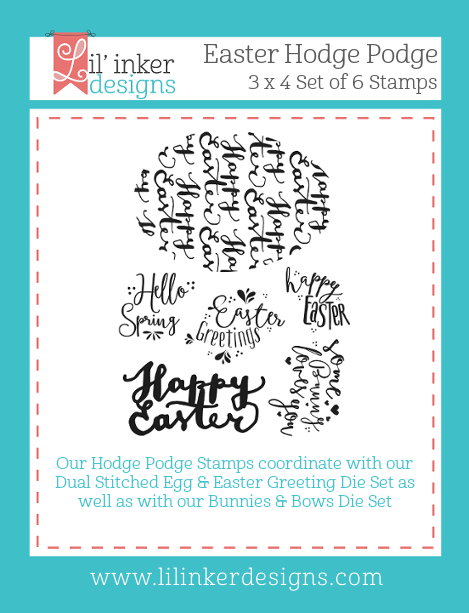 I finished the card with a white bunny die cut from the previously released Bunnies and Bows Die Set, and added a sentiment with the new Easter Hodge Podge Stamp Set. Gah! I so very much LOVE everything in this new release, and how well they work with previously released products. 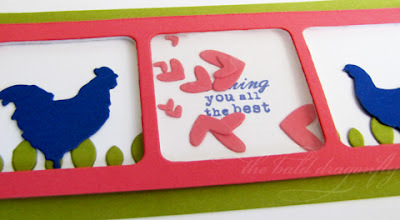 Makes card making so easy! 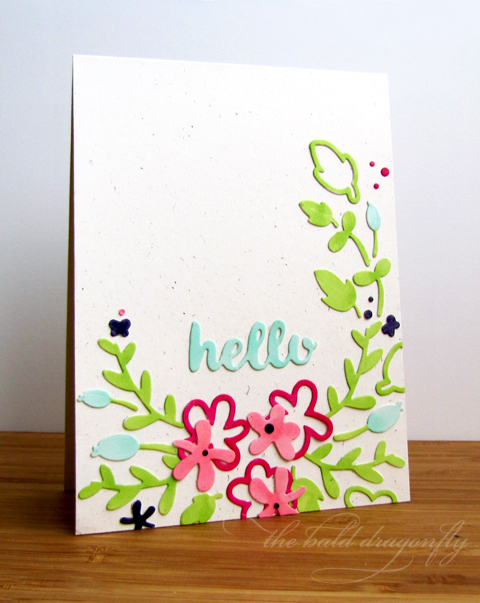 We each did our own design, so I chose to play with Wplus9's Bountiful Blooms Dies. 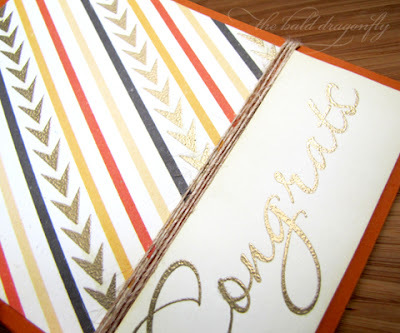 I ran the combined dies twice with vanilla cardstock, then colored the images with Copics and adhered the arrangement onto a speckled vanilla card base. 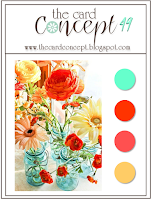 I didn't really have a plan, so it is a rather random arrangement, but I did use all the colors in the inspiration palette. It was fun to create a card with dies only, and I love the sentiment. I'm also entering this into Simon Says Stamp Monday Challenge: Inspired by a Song. Adele's Hello has been one of my favorite songs lately! 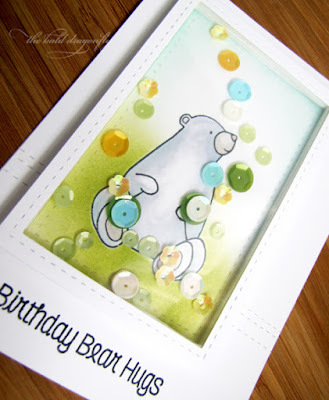 Now onto Chase's card for the challenge, he chose the stamps and the dies and the design. I could tell he had a plan and he executed it! 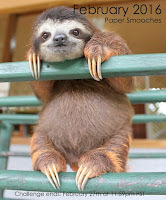 Gah, I think it is the cutest! 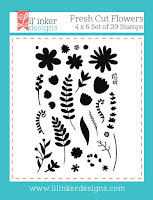 He used Lil' Inkers Robot Builders Stamp Set and Stitched Mats: Rounded Rectangle Dies, and the flower on the belly he drew himself! 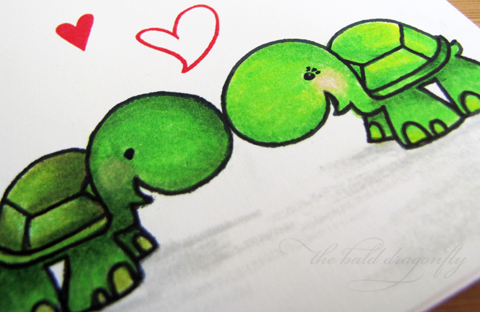 I helped him use the MISTI and watched him carefully with my beloved Copics, but he did a great job. 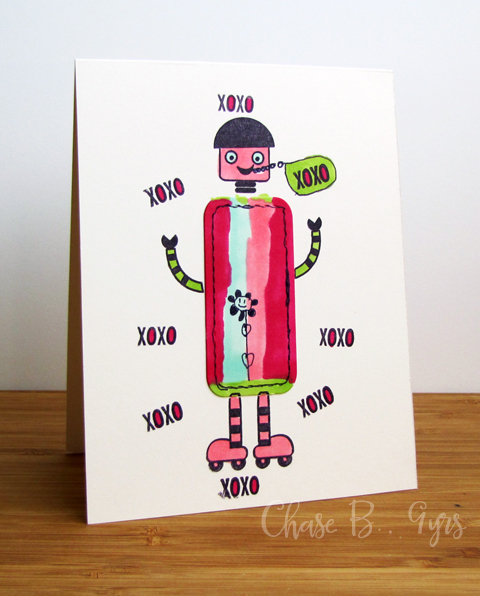 Chase is also entering this one into the Simon Says Stamp Wednesday Challenge: Anything Goes! 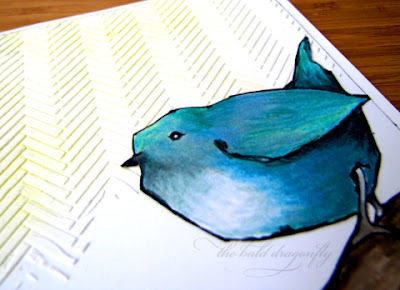 Finally, I have another card for Papertrey Ink's Make it Monday Challenge: Watercolor Resist. This was a tough challenge me, I wanted to give up but didn't. 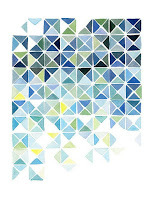 I layered yellow, then green and then blue watercolors, with layers of rubber cement masks in between. 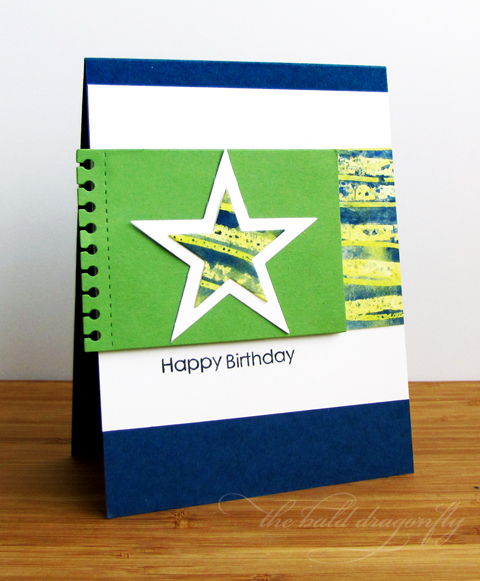 I ended up with a boy or guy birthday card, which is much needed, so I guess it works! 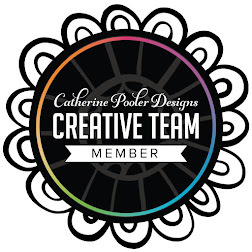 It is an unnaturally beautiful, warm and sunny day here in Wisconsin so I'm going to get out and enjoy the weather and not list the supplies I used, but please feel free to email me or comment with questions! Soft pink, blush, olive green and gold...oh my! What a beautiful color combination and even more beautiful inspiration picture over at Papertrey Ink for the February Blog Hop Challenge. I was inspired most by that beautiful bloom on the right side of the picture, as well as the gold ribbon running down the left side. 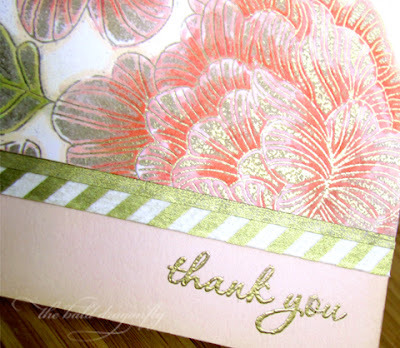 What I did was ink up my In Bloom Impression Plate with Versamark Ink, embossed a white cardstock panel, then gold embossed it. I colored in the remaining areas with Copic Markers. I've never tried this technique before, and I think I will do it more often! 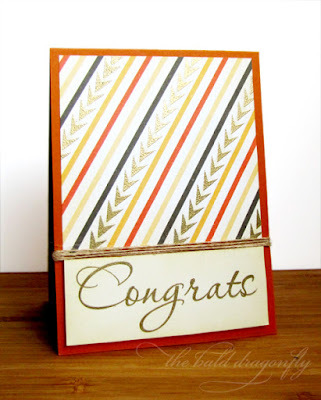 I mounted the panel onto a blush card base after inking the edges, bordered the image with gold washi tape and then gold embossed the sentiment. 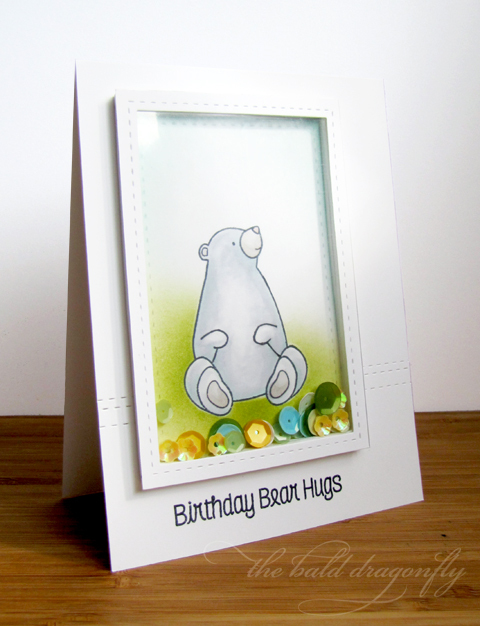 Bear hugs are the best, whether they are from little boys, tweens, parents, family or a good friend. I created a shaker card, still trying to get the hang of it, but after two tries I got one that works! I started by embossing a white card stock base with stitching, following the MFT Card Challenges: Sketch 268 and added a sentiment. 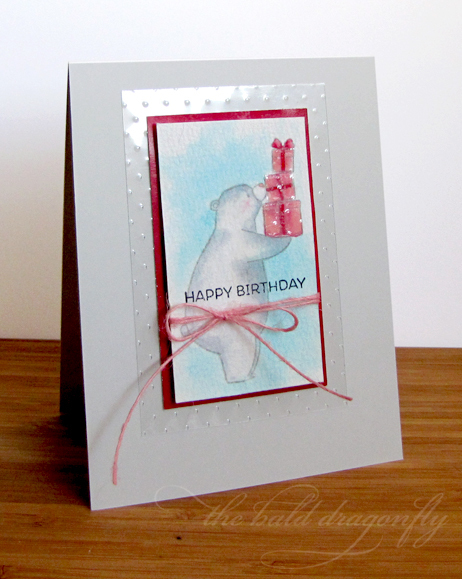 Then I cut a rectangle from white cardstock and stamped the cute bear from Birthday Bears. I masked out his one paw that was lifted in the air, and redrew it to match the other. I also added a smile. He was colored with Copics. I then masked the bear off and inked a loose landscape onto the panel. 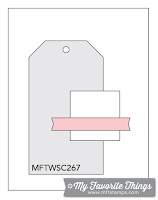 The shaker was created using the same rectangle die with two layers of foam, acetate and a cardstock border. 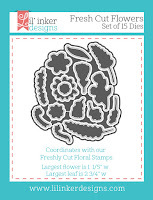 These rectangle dies really make for easy lining up for shakers. Before adhering the shaker border, I added some various sized sequins and flower shaped sequins. Can't wait to give this to my little nephew for his birthday. And of course, because it is a shaker card, I'm entering this into the Simon Says Stamp Wednesday Challenge: Shake it Up! Dang, making cards for the male gender is kind of difficult, but I welcomed the challenge when a buddy asked me to make one. Having been inspired by the latest Papertrey Ink's Make it Monday to customize patterned paper, I gold embossed a series of arrow points, then applied the same treatment to the large sentiment and adhered both to a card base. The sentiment panel was mounted on foam. I finished the card with four rows of burlap string. Not only masculine cards being a challenge, so is trying to photograph the shine from embossing powder! I thought the earth tone colors, gold, burlap and the not too girly script font were a good match for guys. 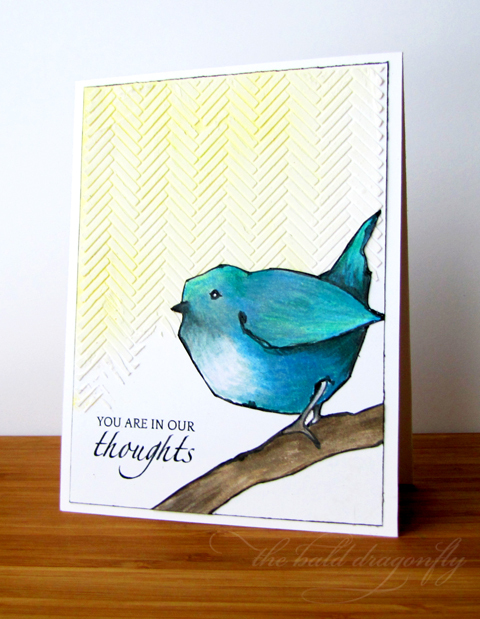 Bluebirds will always hold a special place in my heart, even if it is just a rendition of one colored with colored pencils. 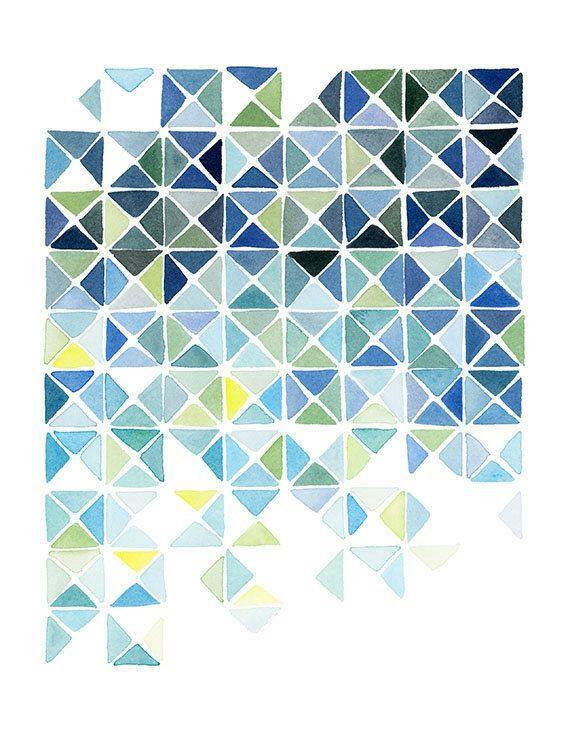 I was inspired by the gorgeous, geometric pattern image at Pinterest Inspired Challenge. So... I started by applying a light sponging of yellow ink onto the corner of a white cardstock panel. I then added a herringbone pattern with a stencil and embossing paste, applying the paste heavily at the top of the panel and less towards the bottom. I then colored (with colored pencils) and fussy cut a digital bird stamp and mounted it to the dried, geometric panel, which was then edged with black marker and adhered to a white card base. 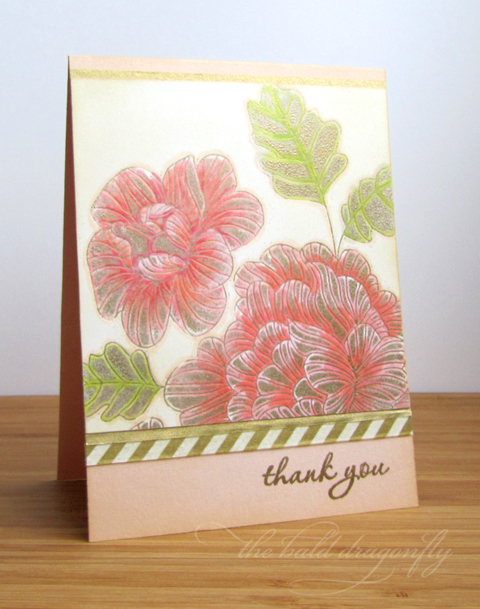 I finished the card with a stamped sentiment. The Whipped Spackle was quite fun to work with. It's really soft looking after it hardens, kind of tricks the eye! I could have mixed some yellow ink into the paste, but I knew I wanted the yellow to show underneath the pattern, to make the pattern stand out more. I'm also adding this to A Day for Daisies Challenge: Add a Touch of Wood! "I wish you bluebirds in the spring, to give your heart a song to sing." 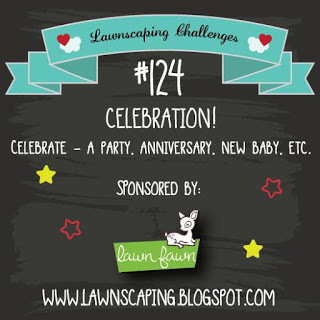 I'm playing along with two challenges with the above card. 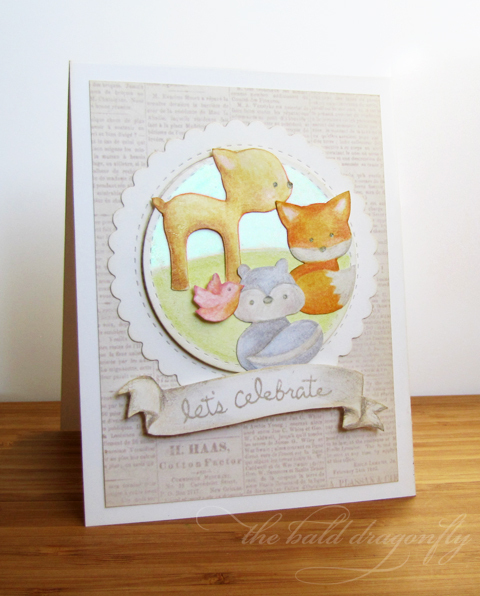 I knew I wanted to try out some no line coloring and make a celebratory card for the Lawnscaping Challenge #124: Celebration...so I pulled out some Lawn Fawn critters from the Into the Woods set, stamped them in Antique Linen Distress Ink and used PrismaColor Colored Pencils to color them in. I was really drawn to the colors from showcased at The Card Concept 49, but I went more muted, to match the storybook theme. 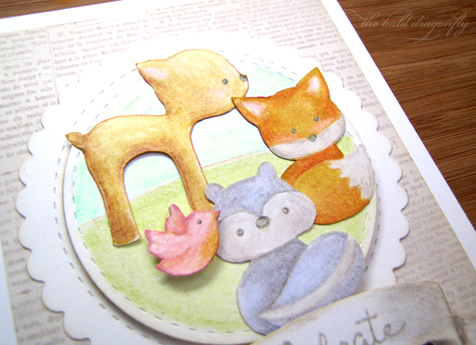 I fussy cut all the critters and adhered them onto a simply colored landscape that had been cut into a scalloped and stitched circle-the circle is raised with foam tape as is the bird. 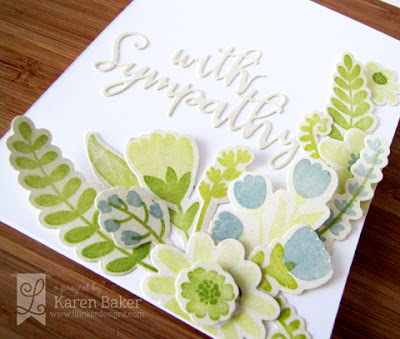 The scene was then mounted to a card base with a patterned paper panel, and then I stamped, colored and fussy cut the sentiment banner. I'm also really enjoying coloring everyday...on a mission to participate everyday for The Daily Marker's 30 Day Coloring Challenge. 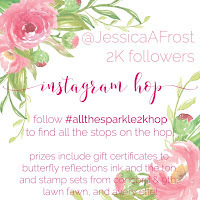 I have some snippets of my coloring on my Instragram (the link is on the sidebar). It's cold here, really really cold. I think the boys and I must have permanently pink noses. 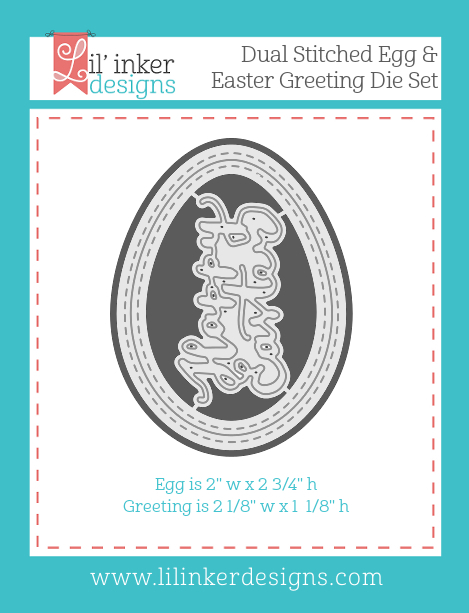 Anyhow, I created another card! Probably because it is too cold to play outside and well, cleaning is not really any fun. I was inspired by the sketch at MFT Card Challenge Wednesday Sketch 267. I used the large sitting bear die from Birthday Bears as the tag, and one of the baby bears as the square. I started by spraying some light blue ink onto a white card panel, to provide a base for the bears. The bears and banner were cut, and then all edges inked, along with a green mat. I colored the noses of each bear slightly and then inked up a sentiment. I'm also playing along with Simon Says Stamp Wednesday Challenge: Spritz and Spray. Playing along with the My Favorite Things Color Challenge 39. 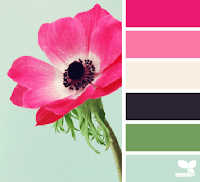 (I see my pink is a bit more coral, but you gotta play with what you have!) 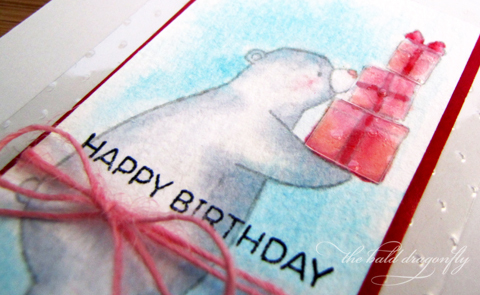 I stamped the bear from Bear Birthdays onto watercolored paper and then washed the background, to the outline of the bear with blue and then colored the bear and presents with Copics. Then I stamped the sentiment. 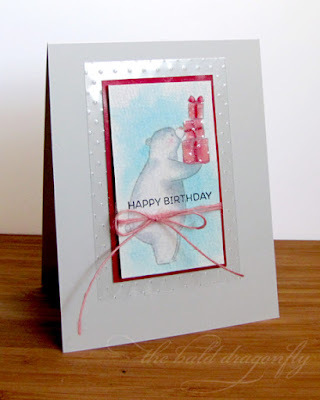 I wrapped the bear panel with May Arts Pink Burlap String and then mounted the panel onto a red paper background with foam squares and that was mounted to an acetate panel embossed with a bit of dots. So I am still struggling to find a good place to photograph my cards, I greatly admire the bright, sunny photos of some of the greatest gurus...it's a work in progress, and like I mentioned above, you gotta play with what you have! 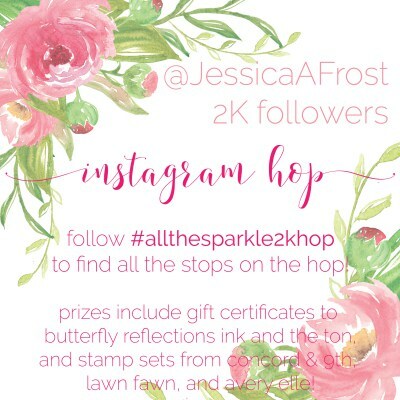 I am on Instragram now too, will you come check it out? I'm hoping to post more "work in progress" and sneak peeks on there. 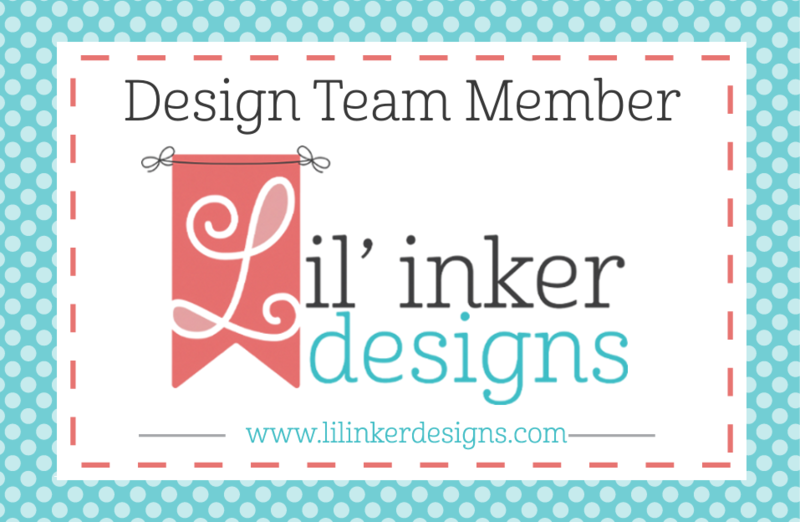 My link is on the sidebar! 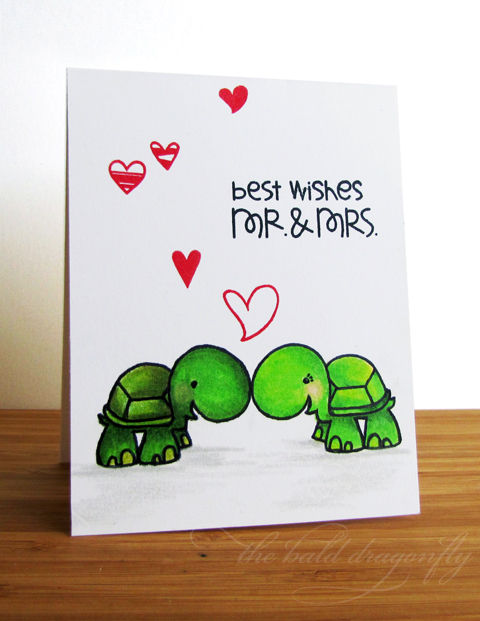 I must be on an animal wedding kick (see the Turtle Love card a post down). 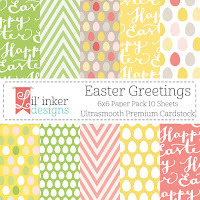 I made a shaker card for the Papertrey Ink Anniversary Festivities, using colors chosen by their Fortune Teller thingy. I admit, I had to have my son help me figure the teller out, he makes them all the time. Shakers are difficult to photograph-any tips are welcome. 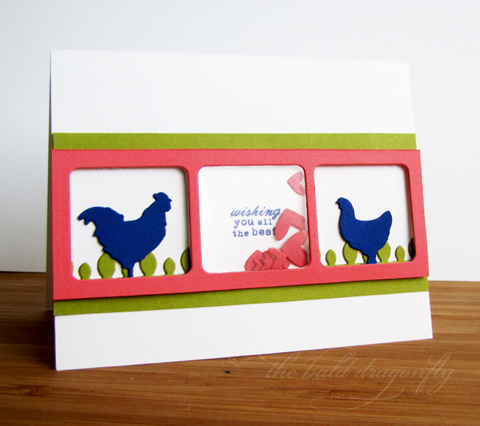 I started with a Berry Sorbet panel that was die cut with three windows, added some grass and a rooster and hen to the ends, respectively. I then die cut the same trio of windows out of white foam and added and acetate panel to the middle window. 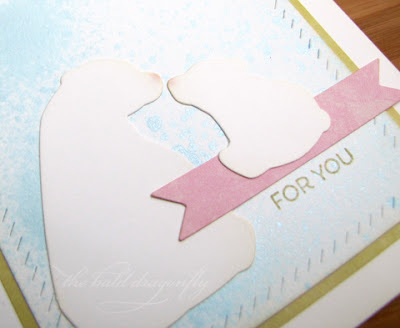 I stamped the sentiment onto a white card base and before adhering the foam, I added some hearts from Lil' Inker Designs. 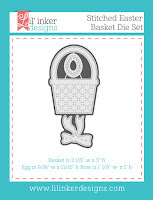 I love that there are teeny-tiny hearts in this die, it is perfect for shakers! 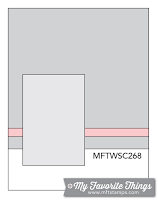 The pink window panel was affixed to the cardbase then, over the foam, to create a shaker. 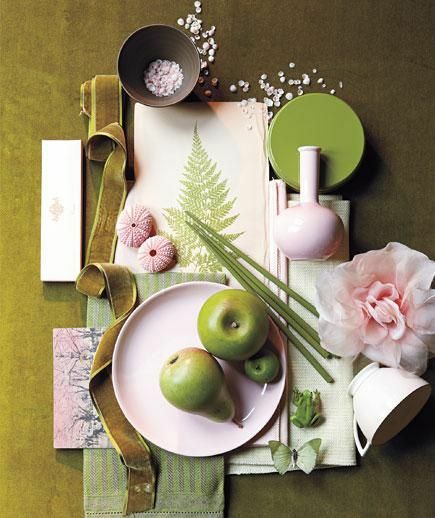 The colors the Fortune Teller picked for me were: Berry Sorbet, Simply Chartreuse and Royal Velvet. 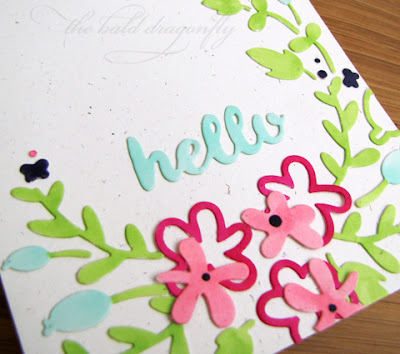 It has been great fun to try out techniques that Kathy shows in her videos for the 30 Day Coloring Challenge. 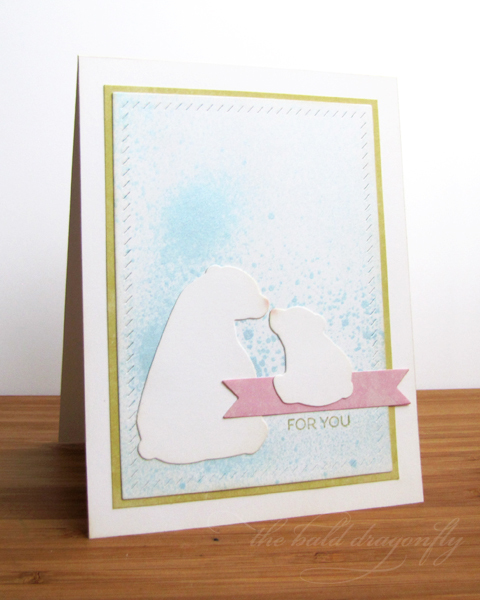 I took the idea of a "blushing animal" and creating shadows and created the above card. I'd like to say my thought process was a bit more complicated than that, but it really isn't! I think of relationships and love when someone, or something, blushes, so I knew I needed two images. And I wanted the someone/something to be fairly simple, as I haven't ever tried coloring shadows. I stamped one cute turtle from Paper Smooches onto a white cardstock panel, then used that technique (what's it called, mirror imaging??) to stamp the other and colored them with PrismaColors. I then shaded the areas underneath them, stamped the heart and a mix of sentiments for a wedding card. This is all completely, truly, 100% one layer too! I am participating in the Paper Smooches February Challenge: Fun & Cute Challenge and Simon Says Stamps Wednesday Challenge: One Layer.